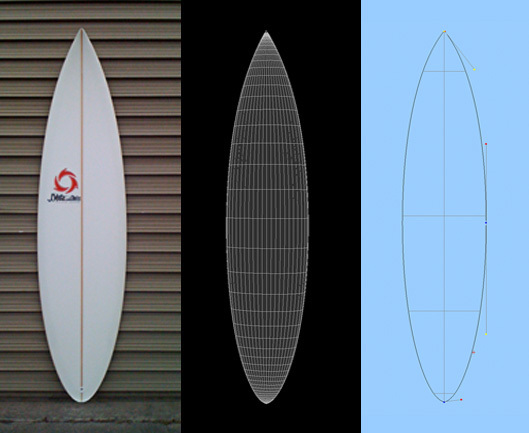 The "Wolf" or Step Up is a high performance short board designed a few inches longer than a pure short board. This design extends short board performance into larger surf. The extra length facilitates easy entry and improved projection in thicker powerful waves. Design features - Rocker: Speed box or continuous. Profiles: Mimics short board profiles with emphasis on volume for paddle and entry in step up conditions, yet foiled a bit more in the nose, tail, and rails than a pure short board. Outlines: Squash, Thumb, Swallow or Round Pin. Bottom Contours: Vee to single concave, or vee to single to double. Rails: Adjusted to surfer's size, displacement, and technique.